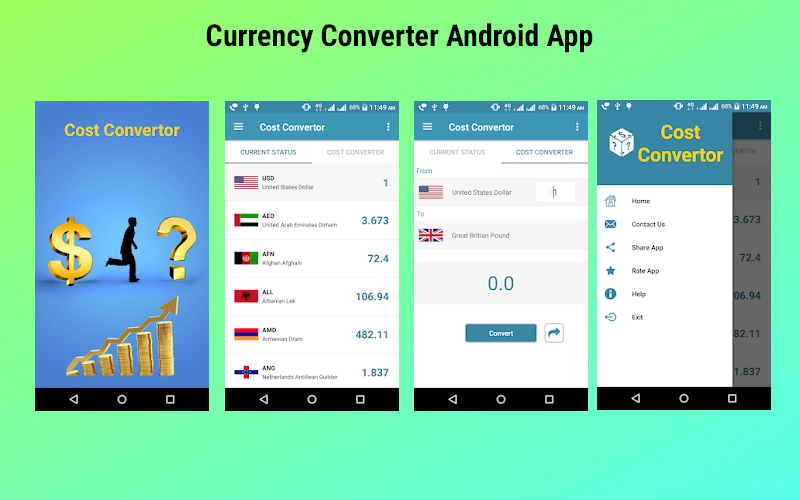 Our Currency Converter Android App is mainly designed to convert one currency into another currency in order to check corresponding rate values. Our currency converter app is ready for sale, the real-time currency exchange rate converter.All the world currencies are available in our android application. Our currency converter Android Application provides live currency rate of every country in the world.PHP Scripts Mall currency application is the simple and powerful app for all the traders. The user interface of our Currency Converter Android App Source Code is very attractive and eye-catching and works on all the android devices and different screen sizes. The user needs to provide their name, phone number; email address and necessary details and the user can login with the email address and password. After clicking the app into the mobile, the user can able to see the app name and cost conversion image in the page for lesser than 5 seconds. In the home page, our application has mainly two fragments such as currency status and cost converter. In the Currency status, the user can see the current status of all the currencies. The user can see the all country flag and currency name and the currency rate. In the Cost converter, the user can do the conversion. In order to covert the currency into another, users need to enter the amount of money and choose the currency to check the monetary value. By clicking the convert button the user can see the rate of selected currency. The home page of our Android Currency Converter Application, has the navigation menu which contains the following option such as Home, Rate app, share app, Contact us, Help and exit. The rate app option is mainly used to rating the app in the Google play store. By clicking the rate app menu, the user will directly move to the Google play store to rate this app. The share option is mainly used to share the app play store URL to other. We can share via the app like SMS and other social media channels also. So it will increase the download of the application.In the contact us option can, you can contact admin person via email. Our Currency Converter Android APK App is user-friendly and more secure to use. PHP Scripts Mall is the right place to deliver the best Currency Converter app to the clients with low price and best quality. Finally got right currency convertor app with Currency Layer API, easy to work around. You people deserving 10 out of 10 star rating! I have transformed my business into higher position through this currency convertor application.